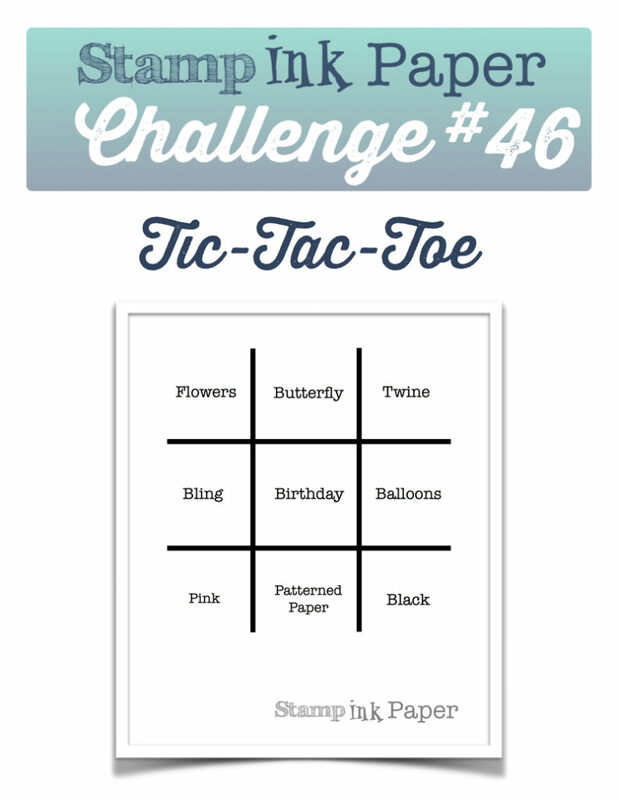 Home / Blog / SIP Challenge 46 – Tic-Tac-Toe! I hope that your Monday was a good one! It was supposed to rain here all day but instead we got a little reprieve and it was overcast with peeks of sun every now and then. No complaints about that! I had a nice productive day getting some crafting done in the morning via FaceTime with Andrea. I went over to my parent’s for lunch, I had a bagel with Liverwurst! I love Liverwurst, must be the German in me! LOL! some phone calls were up next, eBay about some charges to my account that shouldn’t have been there, I did call previous and they assured me that it would be taken care of, of course it wasn’t! I have also been having issues with my blog since the last WordPress update so I called GoDaddy, the guy tried to be helpful but told me I would have to pay $30 for them to change something that might fix the issue. Umm… I didn’t do anything to make it not work so I don’t think that I will be paying to get it fixed thanks! By some little miracle it seems to be working all on it’s own again (or maybe Trent from GoDaddy fixed it?!)! After that I stopped by Heather’s to drop off the Nespresso that she bought from me. Speaking of Heather it’s her Birthday today!! Happy Birthday Heather!! From there I stopped by Anthony’s to see him and Bill and then I came home and had dinner. Taylor and Kiera stopped by to binge watch some YouTube, some guy that makes things with a Lathe! Sigh! Before calling it a night I ran to Target to get a few things. Today I have lots to do once again, but it’s all good stuff! This entry was posted in Blog, Cards, Crafts, Embellishments, Embossing, Hero Arts, Photopolymer, Pretty Pink Posh, Stamps, The PaperCut, We R Memory Keepers and tagged Card Making, Crafts, Hero Arts, SIP Challenge. Bookmark the permalink. Great job, as always. That embossing folder really makes a difference. It is one of my favorites which I purchased after seeing one of your cards! The colors are exquisite. Today you used my absolute favorite EF of all time and that thin strip of gold CS really put the class into this design. What an amazingly beautiful card this is. Your sentiment die could not be more perfect. Absolutely breathtaking card if you ask me. Yes, I love that EF too! Thank you very much! I love the Hero Color Layering sets! What an absolutely stunning card, Justin. I love the EF, the pink flowers, the gold strip and the sentiment font. Altogether they make a beautiful card. My wish list is growing longer and Hero Arts is becoming my favorite company. Have another great day! oh my gosh! 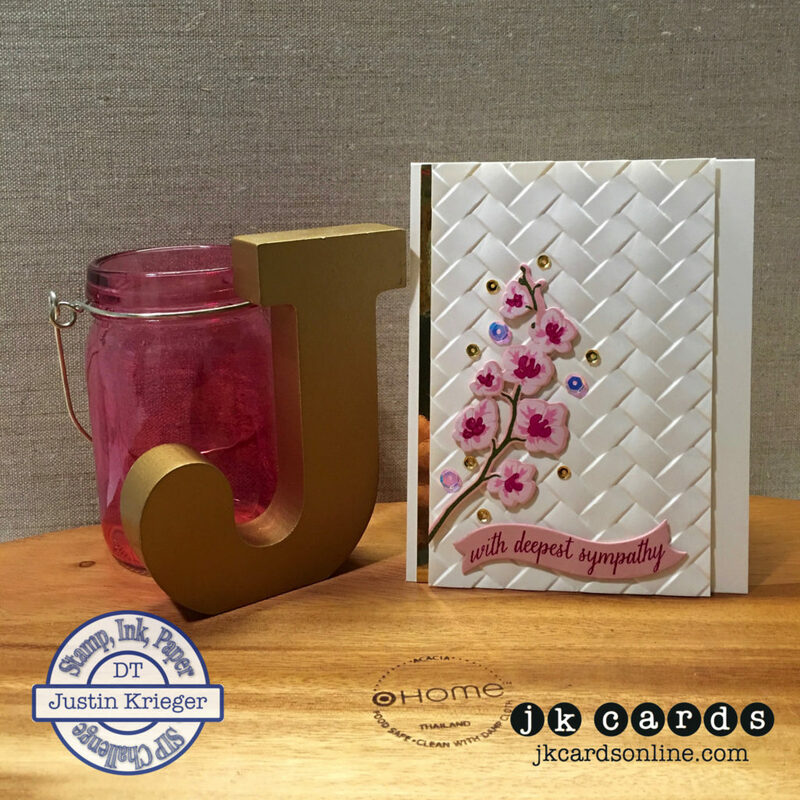 that embossing folder makes everything elegant and wonderful about the card. another product I’ll have to acquire based on your beautiful card artistry; I’m going to start blaming you for added inventory to an inventory that is already over-exploding! lol! thanks for sharing such a beautiful tic-tac-toe designed card. Happy Birthday, Heather! I hope you are doing something fun and wonderful today!! Justin, you hit another one out of the ball park again with that EF. Gorgeous! That gold mirror paper is fabulous. Now I have to go look for it, darn you. Did you notice how many people are adding to their over-abundances because of you? Do you feel the least bit guilty? Don’t you wish you were getting commissions? I am going to try my hand at the drapery pleat fold soon. If it is a success, I may make a card for you too!! I’ll pass on your Birthday wishes to Heather Nancy! Thanks! So glad that you like the card! The EF is a favorite of mine! I did notice that I’m a bit of an enabler! I’m coming up with a way to make that easier of you too! Oh! The drapery fold! That sounds like fun! This is a beautiful sympathy card. I think a sympathy card should be soothing and that is exactly what this is. The embossing folder is beautiful and the orchid is perfect. Love it!